One piece of yard equipment that every homeowner should have is a leaf vacuum or a leaf blower. These two pieces of equipment are often combined into one and are used primarily to move around and collect leafs, grass clippings, and other small debris that clutters the yard. Some models of leaf vacuums also have small mulchers to grind up the leaves and debris to lessen the volume of waste that is generated. Leaf vacuums come in both gas powered and electrical varieties. Depending on the size of the motor, the noise level can sometimes be a concern and certain neighborhoods and municipalities have ordinances forbidding the use of equipment that operates above certain decibel levels. However, the benefits of a leaf vacuum are great and as long as you wear hearing protection when using one, they are quite safe. Most leaf vacuums are handheld varieties, but some come in backpack form or even as push behind models for more power. Below are a few popular models of leaf vacuums that you might look into. The Toro Ultra is a three in one leaf vacuum, blower, and shredder that makes yard work fun and easy. Because it is an electric machine, it is quieter, lighter, and cleaner than many gas blowers. One of the best features of the Toro Leaf Vacuum is that it has a variable speed motor that allows an infinite number of settings between 112 and 235 mph. That means that you can change the speed of the blower or vacuum to match the task you wish to complete. Another beneficial feature is that you can switch between blower and vacuum easily without the need for any tools. The parts that need to be changed can be removed and put on with quick release latch. The metal blades that make up the mulcher are efficient and can break up leaves and other yard debris into tiny pieces. They can reduce up to sixteen bags of yard waste into one bag of mulch. If you garden, you can recycle the resulting mulch. Perhaps the best part about this leaf vacuum is that it is electric powered. It starts up with the push of a button rather than a cumbersome pull cord. There is much less maintenance because you do not need to worry about gas oil mixtures or making sure you are protected from the noxious exhaust fumes. It is also only seven and a half pounds so it is not hard to move around like some gas powered vacuums can be. You can even take this machine up a ladder to help with gutter cleaning. The Dirt Devil Leaf Vacuum has some similarities to the Toro vacuum including a variable speed electric motor and a sixteen to one mulching ratio. The variable speed motor only goes up to 200 mph, but like the Toro it is electric. Having your leaf vacuum on a cord means that you will never have to stop a job in the middle to fill up a gas tank or charge a battery. It is a little bit heavier than the Toro machine and it has a different nozzle. The blower nozzle has a tapered end so that you can more accurately direct the air flow. 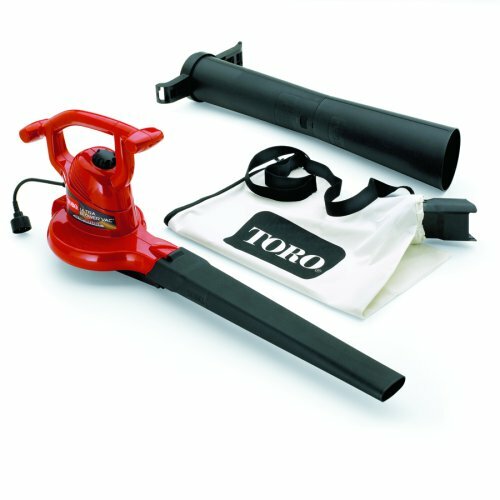 But like the Toro, the pieces are easy to attach and detach so that no tools are needed to change between the blower setting and the leaf vacuum setting. 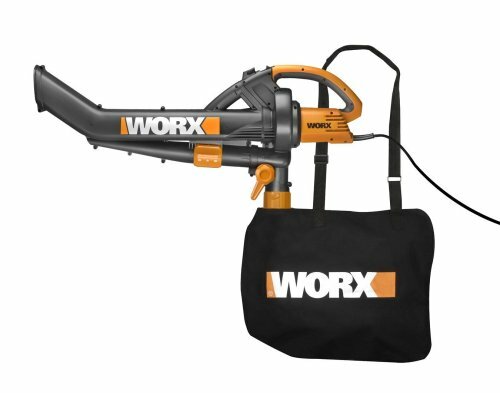 The WORX leaf vacuum has several features that distinguish it from the other blower/vacuum/mulcher combinations. 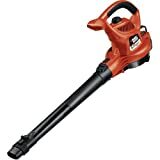 Like the others, you can use this electric powered machine as a leaf blower or a leaf vacuum. The difference is that the WORX leaf machine can switch with the flip of a switch rather than changing out tubes. The switch is much faster and easier to accomplish. With this improvement, you gain a little bit of weight. The WORX leaf vacuum weighs about ne pound more than the Toro leaf vacuum. Another positive difference is the fact that the WORX leaf vacuum and blower has an angled nozzle so that you can reach under vehicles or decks with the blower or vacuum without getting down on the ground. A third improvement is the addition of a shoulder strap for the collecting bag. Instead of a small bag that sticks out of the end making the leaf vacuum harder and harder to manage as you use it, the bag hangs over the user’s shoulder so that the leaf vacuum does not get any heavier as you do your work. The top speed of this model is about 210 mph and it has a mulching ratio of ten to one making it a little less efficient than the other mulchers. 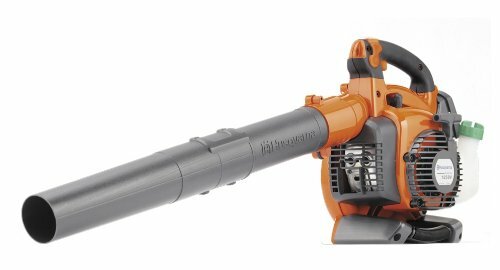 The Husqvarna gas powered leaf blower and leaf vacuum is just as easy to use as the electric leaf vacuums. It is slightly heavier at just over nine and a half pounds, but it has a unique ergonomic design that makes it easy to handle without putting too much pressure on your wrist while using it for long periods of time. Most home owners are concerned about starting a gas powered piece of yard equipment that is handheld because they are afraid they will not have enough resistance and it will be difficult to get the leverage needed for a traditional pull start motor. The Husqvarna, however, has an improved starter that means the resistance in the starter cord is reduced by forty percent. The mulching ratio is sixteen to one and the engine is efficient to run for hours on one tank of gas.